A paperback edition of a Halloween favorite. A pinch of this . . . a dash of that! Miss Fiona guards her secret recipe well, but everyone agrees that it just wouldn't be Halloween without at least one slice of her extraordinarily delicious pumpkin pie! Join the trick-or-treaters as they creep past the old cemetery to Miss Fiona's for a taste of her special Halloween recipe. Spooky illustrations enhance this tasty tale of fun. 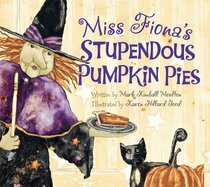 About "Miss Fiona's Stupendous Pumpkin Pies"